The Galapagos is one of the most exciting destinations in the world. Guests will have the opportunity to dive with playful Sea Lions, travel to the famous Darwin and Wolf for thrilling diving to see Hammerhead Sharks, Whale Sharks, clouds of Tuna and much more. The scenic view of the Darwin Arch is is as picturesque as you can imagine. ​To see descriptions of the dive sites visited, click here. Taxes and Fees: All paid in cash. USD $100 Park fee, $10 Galapagos Visitor's Visa card, $31 Guayaquil or $41 Quito Airport departure tax. June - November: Water is cooler 60-75F, 16-24C Whale shark sightings are greater. Larger schools of hammerheads, manta rays and eagle rays. Whale Sharks, Hammerhead Sharks, Tuna and more. The Galapagos should be on everyone's "Bucket List"
The diving itinerary now includes visits to Isabella Island where giant Mola Mola and mantas are frequently encountered. Guests depart the yachts Wednesday morning for a land tour to the Highlands of Santa Cruz Island to see tortoises, lava tubes, pit craters and the Scalesia Forest. Guests will enjoy lunch in the town of Puerto Ayora at a local restaurant and will have time for shopping. Thurs: Baltra Airport Afternoon Greeting by Crew, Bus Transfer to the Dock and Boarding. Welcome, and Orientation Dive at North East Coast of Baltra Island. Sat: 5 Dives at Wolf; 2 morning, 2 afternoon and 1 night dive. Sun: January to May: 2 morning dives at Darwin and 2 afternoon dives at Wolf. June to December: 5 dives at Darwin; 2 morning, 2 afternoon and 1 night dive. Mon: January to May: 5 dives at Cabo Marshall; 2 morning dives, 2 afternoon and 1 night dive. June to December: 4 dives at Wolf; 2 morning and 2 afternoon dives. Wed: 1 morning dive at Cousins Rock.Arrive at Itabaca Channel. After lunch guests will disembark at 1 pm to go ashore for a private bus tour to see the beautiful Highlands of Santa Cruz Island. This will include Los Gemelos (The Twins, two enormous sinkholes), Scalesia Forest for a scenic view over Santa Cruz, a Tortoise Reserve to see giant tortoises, and Lava Tubes. After the hike, guests can walk through town, shop and visit the tortoise-breeding center Fausto Llerena at the Charles Darwin Research Station. Guests will have dinner ashore at a local restaurant of their choice (only meal not included in the cruise). Will depart at 10 pm for Baltra. The Humboldt Explorer was designed by one of the premier marine architects in Ecuador, and is the first of her kind. 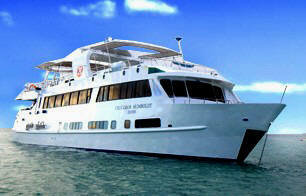 She is a 106 foot, 2 level steel mono-hull vessel built for stability on the long crossings to Darwin and Wolf. With a cruising speed of up to 10 knots she should be able to offer greater itinerary options for your cruise in the Galapagos. A teak sundeck features open and covered areas, a Jacuzzi, wet bar, BBQ grill and ample seating for all. The indoor dining and lounge area comfortably seats all guests as well and provides a bar & entertainment center. 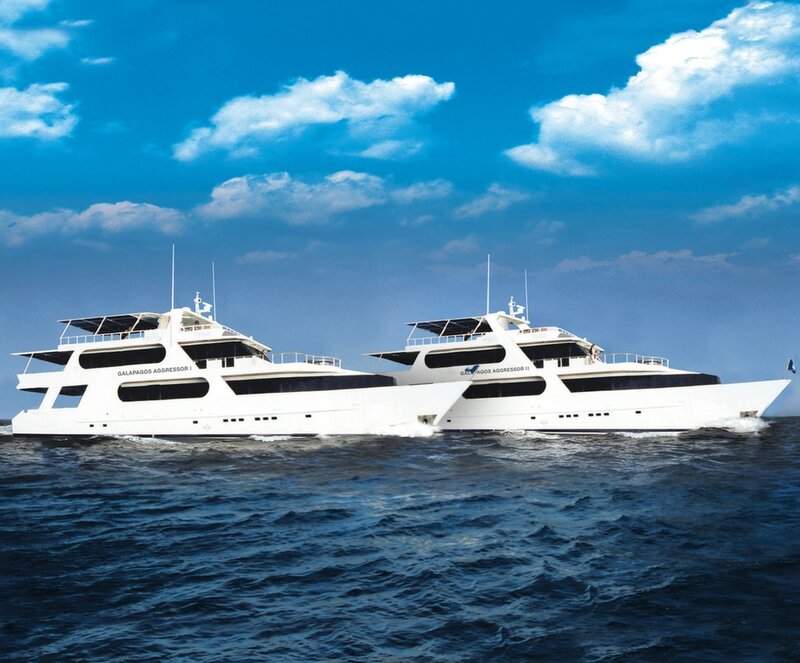 Accommodating 16 guests in 8 air-conditioned staterooms, she features lower deck staterooms which have been raised to a level which allows a window in every cabin. She has 6 lower and 2 upper staterooms, each with private baths, full-size twin beds that can convert to queen beds and large windows. All rooms have flat screen TV/DVD. Whale sharks, hammerheads sharks, Galapagos sharks, white tip sharks,tunas, mantas, stingrays, eagle rays, barracudas, snappers, goatfish, wahoo, groupers & mola mola, dolphins, sea lions, penguins, moray eels, turtles & red-lipped batfish, possibly even sailfish, tiger sharks, marlin and killer whales. And that's not all. There is a broad spectrum of marine life that make the Galapagos Islands one of the world’s foremost diving wonders. Exactly what you see, of course, will depend on the time of year, the region of the Galapagos and, needless to say, the weather & current conditions. You will have maximum 4 dives daily, depending on weather and sea conditions. 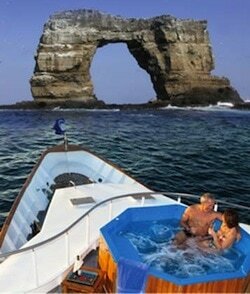 San Cristobal Guests fly to the Galapagos Islands from Mainland Ecuador, arriving in the late morning. Guests are met at the airport and taken to the vessel. Boarding the vessel after 1:00 p.m, guests will depart for a short crossing to a calm site for a check out dive and safety briefing. After dinner, the vessel will depart to the next scheduled destination. Bartolomé 1 dive depending on weather Sightings include rays & schools of fish. sea lions, Galapagos sharks, and silky sharks. Night at anchor. Wolf Island 6:30 dive. Transit to Darwin Island. 11:00 and 2:30 dives. Sightings often include hammerheads, red-lipped batfish, eagle rays, sea lions , Galapagos sharks, and silky sharks. Night at anchor. The vessel will travel 2 1/2 hours to Darwin early Friday. (in season) eagle rays, Galapagos sharks, turtles and silky sharks. Cousin’s Rock 8:30 dive –This is a great macro diving with an excellent chance of seeing sea horses, sea lions, and eagle rays. Lunch will be served while transiting to Santa Cruz (3 hrs). In Santa Cruz visit the giant tortoises in the highlands, and visit Puerto Ayora town and the Darwin Centre on your own. Humboldt Explorer departs Santa Cruz at 9 p.m. to San Cristobal. Note: Itinerary is subject to change without prior notice depending on weather conditions or Galapagos National Park regulations. For those flying to and from the Galapagos on Mondays to join the vessel, a guide will meet you upon exiting the baggage claim area for transfer to the vessel. Galapagos is a year-round destination. In general, May to November, the time of cooler water temperatures, is the best season for Whale Sharks. During the warmer water season, December to April, there will usually be a greater preponderance of ray species. But there is so much all year round that it doesn't make a great deal of difference when you choose to go. You are always assured of a magical adventure. Lovely, spacious and comfortable, the Galapagos Master, formerly the Deep Blue, was built in 2002 and accommodates 16 people in 9 double cabins with twin or double lower beds, private bathroom and air conditioning. After extensive refitting, she will be relaunched as the Galapagos Master in May 2015 by Worldwide Dive and Sail, the owners of the Siren Fleet. in You will find her living, dining & bar space large & welcoming, plus you’ll find a library & a big sundeck in addition to a covered back deck for your relaxation time. Galapagos Master has all the comforts you expect in a top quality dive vessel, including a great diving platform & nitrox air compressor. Reports are that the food is excellent! The owners of the vessel are committed to sustainability & grow much of the food that will be served on your cruise in the Galapagos Islands themselves. For photographers, she provides ample room for equipment, with two large photo tables & a rinse tank to easily accommodate all your needs. 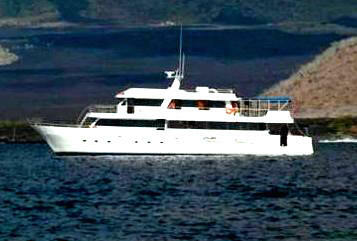 Plus, the new permit authorizes both diving and land visits with naturalist guides for this vessel. 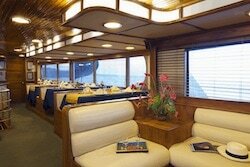 There are lounge chairs on the sun deck to enjoy between dives and TV and DVD player on board. There are lots of DVD’s with movies and CDs with music. There are 9 double cabins that include private bathroom, (private head and shower, hair dryers). 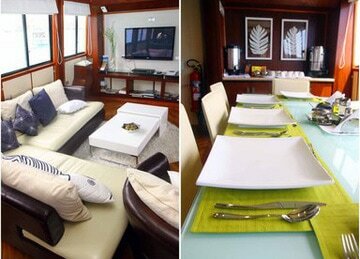 4 lower cabins have port windows, the upper cabins have large picture windows. 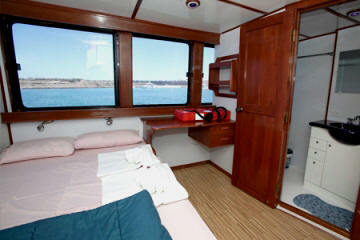 On the main deck there is a queen room with private bathroom. Bed linen is changed every other day on an 8-day cruise. Towels are changed every day. Laundry service is unlimited, you may wash and dry at any time during the trip. 110 and 220 electric power and US and European PLUGS. All meals, snacks, soft drinks, juice & local beer are included. Wines can be purchased on board. Hot drinks and snacks and warm towels are offered after every dive. All meals are buffet style and include everything you would find in a hotel. The food includes local and international cuisine - Each morning, breakfast includes fresh fruits, cereals and juices, milk, soy milk, with hot entrée (ham, bacon, sausage, etc.). Lunches feature hot soups, salads and/or entrées, that include, beef, pork and chicken that are raised at the farm. Dinners are diverse, including seafood, beef or chicken. Fresh fish is supplied every week by local fishermen. Each evening you will enjoy fresh homemade desserts. You will have 3-4 dives daily and land visits on certain days. Most itineraries will be 8 day/7 night trips. There are some 10 & 11 night trips. There are two Zodiacs, each 6.20 metres, with 2 50 HP 4-stroke outboard motors each, and there are two guides on board for every cruise & 3 guides with the company. All crew members are trained and certified by the Ecuador Marine Regulations. This is a sample itinerary only. Itinerary is always subject to change based on weather & sea conditionsand the regulations of the National Park. Isla Lobos is name after the sea lions (“lobos marinos” in Spanish), which populate this small flat island, 10 kilometers north of San Cristobal. The name certainly suits the island, for the sea lions are abundant and of all ages. In Lobos Island we’ll perform the equipment check dive; here among your dive buddies you’ll find the aforementioned sea lions but also marine iguanas, turtles and sting rays. As exciting as this first dive is, it is just a small preview of what you may encounter in your next dives, because, in Sinatra’s immortal words, “the best is yet to come”. Located at the northeastern shore of Isabela, below the 1707 meter Wolf volcano, Cape Marshall offers drift diving on incredible reefs or near-vertical volcanic walls adorned with black corals. Giant Mantas, Galapagos horned shark, the Galapagos rock bass (Camotillo), the gold rimmed surgeonfish, sun fish, sea lions, the harlequin wrasse, the sailfin grouper (Bacalao) and large schools of Salema fishes are some of your potential companions in this fascinating dive site. The water temperature varies between the 13 and 25 degrees, and the depth range goes from 10 to 120 feet. Wolf Island, along with its sister Darwin Island, is considered the best diving destination of the world. This small island located more than 100 kilometers to the northwest of the main Galapagos island chain. It takes around 14 hours to get there, but it is more than worth it. Here you’ll have it all: schools of hundreds of hammerhead sharks, sea lions, manta rays, turtles, iguanas, Amberjacks, Trumpet Fish, Hogfish, Butterfly Fish, eel, dolphins and, with some luck, whale sharks. Wolf Island is also prolific in corals and reef life, with more than 8 species of corals, and the greatest diversity of tropical fish of the island. Some of Wolf Island incredible dive sites are Shark Bay, The Landslide, La Banana and Islote La Ventana. But Wolf is also a great experience above water, for it is the home of literally hundreds of thousands of seabirds such as Red-footed boobies, nazca boobies (also known as masked boobies), frigates, pelicans and swallow-tailed gulls. Considered by many the best place to dive in the world, Darwin Island (formerly known as Culpepper Island) marks the end of the archipelago to the North West. The island is barely over 1 km² in size and 168 meters at its highest point. Here you’ll have the unique opportunity of swimming with dolphins, eagle rays, spotted morays, manta rays, hammerhead sharks, Galapagos sharks, pilot whales, melon-headed whales and the enormous whale sharks. Also in the amazing dive site you may encounter blue-spotted jacks, scorpion fish, rainbow runners, hogfish, big eye jacks, sailfish, trumpet fish, parrotfish and many other different species of marine life. Darwin Island is really a diver’s dream come true. There is no dry access to the island for it emerges vertically, but from the Yacht you’ll be able to spot the endemic Darwin Mockingbird, sea lions, penguins, red footed boobies and masked boobies. Another famous attraction of this island is the Darwin’s Arch, an impressive arch-like stone formation emerging in the middle of the ocean. Roca Redonda, located 25 miles northwest of Isabela, is the summit of an underwater volcano rising almost 3000 meters from the sea floor. This island has a surface of approximately 3 acres and has a very distinctive plateau-like shape. Several lava flows can be observed on the island and in the shallow water and there are various caves, inhabited by several unique kinds of seabirds, such as the night-feeding gull. This remote and small island is a good place to find schools of scalloped hammerheads, yellow tailed surgeonfishes, barracudas, jacks, Galapagos grunts, king angelfishes, mantas, and even the huge sunfish, the giant tail-less fish. A special attraction is on the Southeast Side of the island. There are several underwater fumaroles (steam vents) in the shallows (12 to 18m) and you can see gas bubbles rising to the surface, which suggests that perhaps the volcano is not quite extinct. Isabela is the biggest island of the archipelago, and it is shaped roughly as a seahorse. On its northwestern, in what would be the “mouth” of the seahorse, is Vicente Roca’s Point. Here the remains of Volcano Ecuador form two coves with a bay protected from the ocean swells. Part of the volcano slid into the ocean, leaving a spectacular cutaway view of the volcanic caldera. The upwelling of Cromwell current, one very rich in nutrients, give rise to an abundance of marine life which, in combination with the protection of the coves, make Punta Vicente Roca one of Galapagos’ top diving destinations. Seahorses, sea lions, turtles, mola-mola (sunfish), puffer fish, Marlin, Galapagos’ penguins and, with some luck, even the Galapagos’ bullhead shark. Among the smaller fishes Punta Vicente Roca offers you frogfishes, electric rays, seahorses and the red lipped batfish. Cousin's Rock is located off the east coast of Santiago (north of Bartolome). It rises barely 10 meters out of the water, to the south lies a big rock separated from the island by a narrow channel. The combination of coral covered rocks sheltering a variety of smaller creatures, a huge variety of tropical fishes and the presence of large animals make Cousin’s Rock one of the favorite sites in Galapagos. Black corals, small hard corals, sea fans, hydroid bushes and red sponges grow in every direction, and because of the many ledges on the wall small fauna populates this site. Among your small companions you’ll find hawkfish, nudibranchs, Galapagos seahorses, Octopuses, and even frogfishes. Among the larger exemplars you’ll see mobula rays, mantas and sharks (white tipped reef and hammerheads), sea lions and large groups of spotted eagle rays. The breeding center “Fausto Llerena” is responsible for the reinsertion of over 2000 galapagos in the archipelago, and is currently raising 400 more. A wooden walking platform guides you through its several stations; from it you can observe the turtles from La Española and even Lonesome George, the only surviving specimen of Pinta Tortoise. At the end of the tour you’ll be in the exhibition pen, the turtles there are used to people, which makes it a great photo opportunity. • NEVER touch or feed the turtles. • Do not stand on the feeding platforms. • Opening pens’ gates or jumping over corrals’ fences is STRICTELY forbidden. The Interpretation Center of San Cristobal allows the visitor to better understand the history of Galapagos from natural, conservational and humane perspective. The “Natural History” wing explains the volcanic origins of the islands, the marine currents surrounding the archipelago, its weather and the settling of several species, among other things. The “Human History” wing narrates the most significant historic events of the discovery and colonization of Galapagos. There’s also an area dedicated to Galapagos present challenges and the people coping with them. The Interpretation Center also offers an outdoor theater, a ship scale models exhibition, a 3D map of the archipelago, and a projection room where documentaries about Galapagos are regularly shown. Also it is surrounded by beautiful landscapes and walking trails. Don’t forget to take your passport with you to have the Official Seal of Galapagos National Park stamped on it.